Shopping for a month at an Asian supermarket can open your eyes to wonderful foods, cause a lot of confusion, and yield some interesting discoveries about how we choose what to put on the table. Most of us are familiar with the American supermarket–maybe too familiar. The Safeway or Wegmans or corner market supplies a lot of convenient food–and a lot of those aisles are full of things that are only a rough approximation of food–but that very convenience can make the local supermarket a rut. The deadening hand of routine takes over our shopping lives: We know what we want, where to find it, when to get it, and what to do with it. These habits can be the biggest obstacles to discovering new regions of the food universe. But abstain from your routine for a week or so and your natural ability as an innovator flourishes. An innovating consumer has a profound effect on the marketplace and the food economy. After all, maybe the American supermarket, for all its conveniences, isn’t actually the best way to sell–or buy–food. At the very least, maybe it’s not the best way to do it all the time. With that thought in mind, I conducted an experiment. For a month, I’d refrain from buying food from mainstream supermarkets and instead choose–exclusively–an ethnic grocery store, in this case a big Chinese/Asian market in Falls Church called Great Wall. Full disclosure: During the experiment, I still traveled to other cities and ate in restaurants–supermarkets have never completely dominated my food life. In any case, for a month I’d go cold turkey on traditional American supermarkets, and for every day out of town I had to do an extra day shopping at the ethnic market. The idea behind this experiment grew out of my economic approach: Food is a product of economic supply and demand, so try to figure out where the supplies are fresh, the suppliers are creative, and the demanders are informed. When it comes to ethnic markets, most of the shoppers are well informed. They come from cultures where food preparation receives more attention than in the United States. They’re also largely immigrants or children of immigrants. Either they hail from cultures where most food prices are lower than they are here or the immigrants have lower incomes themselves, or both. It seemed natural to select what’s probably the world’s oldest and perhaps most sophisticated food culture, Chinese. Great Wall Supermarket is in the Merrifield area of Falls Church, about a 20-minute drive from DC in a part of Fairfax County with plenty of Chinese immigrants. The Chinese-owned store, in a strip mall, has ten long aisles as well as some side spaces. The most daunting task is finding something. At first, even though I’d been there many times and I’m relatively familiar with Chinese cuisine–by Western standards at least–it could take me 20 minutes to find just one or two items. It felt like walking into a labyrinth, even with my savvy 21-year-old stepdaughter helping out. Many of the jars are labeled in Chinese characters, with the English small and hard to find. So if you’re told “aisle eight, in the middle, on the right,” it’s a help but not a solution. You’re still confronted with an array of hard-to-distinguish jars. Even if you know something about Chinese food, “bean sauce” comes in a number of colors and varieties, and the store has dozens of soy sauces. Once I moved beyond the highly visible items such as meats, I struggled to find what I wanted–at least at first. The dried goods and candy were hardest to browse through. Not everything had an English label. Often I didn’t know exactly what I was looking for, if only because the name of something in a book or cookbook didn’t correspond exactly to the name on the package. Was ya cai the same as “pickle mustard vegetable” or “pickled mustard green”? I still don’t know for sure, although I think so, and that’s assuming I can find the English inscription at all. What’s more, when I entered those aisles, I sometimes had the feeling people were staring at me, thinking: What does he want here? I learned quickly how dependent I normally am on background cultural knowledge and simple rules of thumb. I decided to consult a Chinese graduate student at George Mason University, where I teach. Rong Rong is studying for a PhD in economics and is from a region near Shanghai. She has a friendly manner and is possibly the sharpest student in her cohort. Rong Rong told me to try the double-mushroom soy sauce, which she claims tastes just like what her mother serves in China. I asked Rong Rong if she had trouble finding items in Great Wall. The answer was no, although she did admit to being confused at Giant, despite almost five years living in the United States. She found Giant’s cereal aisles the hardest to master, and even though her English is very good she can’t read all of the labels nearly as fast as I can or recognize from a glance what an item is going to taste like. Another obstacle in using Great Wall is asking for directions to sought-after items. By all appearances the staff works hard, and finding an employee isn’t difficult. The problem is that virtually all of the workers are–oddly enough–Spanish-speaking, most likely from El Salvador, with varying abilities in English. I speak Spanish, but this isn’t always much help. I don’t know some of the words for Chinese items in Spanish, but more commonly there isn’t a good translation. Salsa dulce de los frijoles doesn’t carry the same connotation as “sweet bean sauce” and requesting it in Spanish didn’t get me where I wanted to go. Dulce y agrio does map directly into “sweet and sour,” but that simple translation is the exception. It’s not easy to find out the Spanish word for pickled fresh bamboo shoots. In most cases, the Latino staff knows neither the English nor the Chinese words for what’s on their shelves. Entering the store is like being robbed of part of one’s linguistic facilities. Another Chinese graduate economics student, Siyu Wang, noted that the prevalence of Spanish speakers among the workers was one of her biggest surprises when she first visited Great Wall. There are some Chinese staff, including most of the cashiers, but their English is limited. One strategy that does work, when it can be applied, is to bring a Chinese cookbook containing the characters for the desired items. Show the relevant characters to someone who works in the store. If you can find a Chinese employee, he or she will lead you directly and enthusiastically to the right place. Mostly, I learned where things were by walking down all of the plausible aisles and then looking in places that seemed logical. Over time, that worked better as I got to know the market. With each visit, I increasingly divided the store into “parts I use” and “parts I don’t use.” Those I used included the produce, the meats and fish and tofu, and the spices and sauces, plus the frozen goods, the dumplings, and the different noodles, dried and fresh. I didn’t do much with the American or Latino goods, the bags of dried fish, the cans of condensed milk, the Asian sweets, or the cookware. The store takes less care than an American supermarket to put the most important items at eye level. There are also fewer highly visible corner displays and promotions, and the overall organization is more cluttered. Then there’s getting your cart down the aisle. The main aisles fit two carts side by side, barely. It’s hard to get down the aisles, and that discourages browsing. My initial tendency was to search the empty aisles, if only because I knew I could get down them without much delay. This obviously isn’t the best strategy, and it led me to spend too much time looking at the highly durable items, which are purchased less frequently by other customers. Overall, I felt far less mobile than in an American supermarket. I started going later at night and avoiding the weekends to circumvent these problems. Great steamed with dumplings. Picking out greens randomly (how I found this) has never steered me wrong. In the back, left-hand corner of the store. The butcher sells uncooked whole ducks as well. In the produce section. Cut off and wash the tips, then toss them into a stir-fry for a fantastic, fresh taste. Smear it on steamed dumplings or almost anything. Aisles six and eight have the oils, sauces, and condiments. There’s an entire aisle of it, to the left of produce. Start with the pork dumplings and steam them. Entirely ordinary but cheaper than what you’re used to, with no loss of quality. Before broiling, brush with soy sauce, fresh ginger, and Chinese wine or other combinations. Think of a dim sum cake with dried pork in a cotton-candy-like role. Tastier than it sounds. In the on-site restaurant. It’s common to see a Great Wall customer spending a solid minute or two inspecting the quality of a pineapple, thereby blocking that portion of the aisle. The customers who seek green peas go through the bin pea by pea. One woman became entranced picking out the best garlic chives, and a man asked for sales help in selecting the best clams–by what standard he judged them I’m not sure. No one was much enamored of the scooping technique for filling a plastic bag. So much for shopping. What about the contents of Great Wall? The most striking difference, other than having lots of Chinese food, is how much of the store is devoted to greens. Once you push your cart through the door, those are the first things you see, and lots of them. They’re fresh and cheap, and there’s a more attractive selection than in any other area supermarket. The greens are the store’s signature, and once you’ve tried them you know you’ll always have reason to come back. Even the other local Chinese supermarkets don’t compare. Great Wall deals with special farms in New Jersey, New Mexico, and Texas to keep the supply flowing. The greens are also the store’s “loss leader”–what brings in customers, who go on to buy higher-margin items. In an American grocery store, the loss leaders are likely to be staples such as milk or whichever sale items are advertised in the circular or on the Internet. The greens at Great Wall include Chinese garlic chives, sweet-potato vines, baby Chinese broccoli, chrysanthemum greens, snow peas, green beans, baby red amaranth, yam tips, white shen choy tips, baby yo choy tips, and many others. Where else can you get six or more varieties of bok choy? Most of the greens are in large piles, look very fresh, and are attended to frequently by staff . My dominant impression of the store is of seeing rows of endless greens, broadly similar in appearance, and not being sure which to buy. But they all turned out to be tasty and easy to cook, if only by steaming. You also can find cabbage, broccoli, spinach, green peppers, kohlrabi, leeks, cauliflower, and squash, among other vegetables, so you don’t have to give up American favorites. The quality of these items is also above average, and the prices are much lower. The greens section is also the busiest part of the store. Often mainstream supermarkets put the most commonly bought items in corners or on the back wall (think dairy), to force long walks and thus to stimulate impulse purchases along the way. Great Wall puts the greens up front. Everyone comes in and stops to look around at them. The traffic jam starts right away. Once I started shopping at Great Wall, I began to eat more greens, and to enjoy them more. I never had to tell myself they would ward off cancer, make the earth a better place, help me lose weight, or ease animal cruelty. I wanted to eat them, and the purchases felt virtually free of charge, given the low prices. I could try any new and unknown green without investing much money. There wasn’t much of a learning curve–I made this shift by my second or third visit of the experiment. If nothing else, I would steam some greens whenever I was making dumplings. Each time I visited, the main question was which green I’d try next and whether I could remember the ones I’d already sampled (often I couldn’t). Each of these leaps into the dark was delicious; that I wasn’t once disappointed is remarkable. It was this kind of lopsided reward that got me thinking about the need for a new kind of food revolution and how it can be accomplished. The nearby fruits were also good, although they can’t compare to the greens. Great Wall has better-than-average grapes, standard American fruits at lower prices, and a touch of exotica, such as durian and rambutan when available. The second notable section of Great Wall is the seafood, which has a far more extensive choice than would an American supermarket. One day I counted 51 bins for distinct seafood items, including crabs, clams, octopus, mussels, and fish. 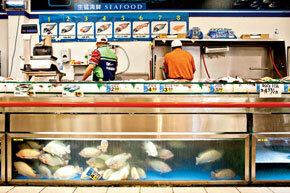 The seafood section is crammed to accommodate this variety, with fish tanks running both below the main counter and on the wall behind the workers. Just about all of the space is used to store and present creatures living and dead. The impression is one of a cornucopia of items that are too bony, with too many scales, or too reeking of the sea to satisfy most American appetites. I asked Rong Rong about the fish, and she expressed some disappointment, at least compared with China. She’s used to live fish in tanks, and she didn’t always find the displayed dead fish tasty when she cooked them. At Great Wall, many of the fish need to be scaled. There are some filets, but most of the seafood is whole–bones, eyes, and all. I often prefer whole fish, especially if it’s accompanied by a good sauce, but I know I’m the exception to the rule in this country. It’s a splendid section for constructing a seafood stock, but I never got the hang of how to convert the dozens of choices into easy-to-make, easy-to-eat meals. Bringing home a bunch of small whole mackerel made me long for the good canned product at Whole Foods. Eating a steamed small mackerel with chopsticks isn’t much fun for me. I like the taste–it just feels like too much work. Most of the shrimp are in their shells. The octopus and squid and mussels all look as if they were just pulled out of the ocean–tentacles and everything. Sometimes not-yet-dead fish have been pulled from the tank and flop around on the ice, but no one seems to notice. The seafood section emits a strong smell. The scent serves as advertising to Chinese customers, but it puts off many non-Chinese patrons. My wife and stepdaughter object to this smell–one reason they don’t like to accompany me to Great Wall. At first they’ll cite pragmatic reasons why we shouldn’t go, but if I continue the debate, sooner or later they come back to the smell. In the online reviews at Yelp, the smell of the fish and meats comes in for repeated criticism from reviewers who, judging by the photos, appear to be non-Chinese. Personally, the smell never bothered me–I even found it a convenient navigational aid. Great Wall was recently charged by authorities with “selling wildlife,” which is illegal in Virginia. Store managers maintain that the bullfrogs, crayfish, swamp eels, and other items the store sells are farm-raised and should be exempt from the prohibition. If the legal questions aren’t resolved in the store’s favor, some of its vaunted diversity in seafood may be on the way out. In the meat section, there are many kinds of beef. One popular item is flank steak–tasty and cheap but chewy–and there are also short ribs, brisket, and various organs, some wrapped in plastic and some behind a counter. Rong Rong remarked that the display of meats reminded her of China, and this was one of her favorite aspects of shopping at Great Wall. Most of the section is devoted to pork, including organs, ears, and feet. There’s also a large clump of fresh pork fat, a useful commodity for many kinds of cooking, not just Chinese. The “beef pizzles” are frozen penises. Unlike in a local Vietnamese supermarket, I never saw pork uterus. Moving along the row, you find chicken feet and duck tongues and plenty of smoked meats, including in ready-to-cook form. Along the top of the meat section is a varied selection of different kinds of “balls,” including fish balls, meatballs, and “fish balls rugby shape.” A butcher sells whole, hanging ducks. I thought I would spend a lot of time eating pork belly bought in the store, but no. Great Wall does sell pork belly but not in thinly sliced form, rather in thick rolls. I tried it once but gave up because it wasn’t easy for me to slice evenly or thinly. Once again, Great Wall assumed its customers had a facility with handling food products and preparing them for convenient consumption. Pork belly is one of my favorite Chinese dishes–sautéed with chilies, ginger, cinnamon stick, soy sauce, and anise star, for instance–but that meal had to wait until I was freed from my obligation to shop at Great Wall. The seafood selection is vast, most of it whole and some of it live. Photograph by Scott Suchman. Click here to see more pictures from Great Wall. The store sold me on the greens idea, and it also got me to cook more, but I never was tempted to learn a lot of new skills in food cleaning, scaling, slicing, and preparation. I spent a lot more time making stocks–chicken, beef, seafood. The spare animal parts are readily available and very cheap. More than half of my cooked meals from this store were based on some kind of stock, and this is one reason the quality of my family’s dinners went up. Making a stock went from a hassle but maybe worth it to a no-brainer. After a few weeks, I took the idea of a fresh stock for granted. Items at Great Wall were usually totally fresh or completely dried or frozen. I was most interested in the fresh items, but diligence was required. The seafood isn’t intended to be kept in the fridge for two days, then cooked–it’s meant to be cooked that evening. Great Wall made no attempt to cover up how much of its products were frozen–in fact, the word “frozen” was prominently displayed on many signs. In mainstream supermarkets, most American customers like the idea of fresh food, even if, as often is the case with fish, it was previously frozen. A pretense of freshness is maintained to various degrees because people don’t want to hear about what’s being frozen and they like seeing the food in a thawed state. I didn’t find such a pretense in Great Wall. Most of the frozen products in an American supermarket are in a separate section, where they’re packaged and ready for reheating. Frozen macaroni and cheese, frozen pizza, and frozen Buffalo wings are staples of my local Safeway. At Great Wall, a lot of the frozen items are plastic-covered meats or seafood, in bins or piles with very little in the way of packaging or branding. You can pick up a wrapped frozen fish, put it in your cart, and move on to the next item. It’s not ready to stick into the microwave; rather, what you’ve purchased is a frozen fish for which you then must puzzle out a preparation. The closest equivalent to Stouffer’s might be the mung-bean-and-taro frozen popsicles. At Great Wall, there’s no shortage of unusual items. An entire half of an aisle is devoted to teas. One I spotted was called Menopuse [sic] Tea. I made a visit to Great Wall with two Singaporean friends and asked them what I should try, requesting that they pick out some mix of iconic products and things I might enjoy. They selected Baked Shrimp Flavored Chips and LongXuSu, a slightly sweet powder, sometimes called Dragon Beard Candy. Both were okay, but neither would be a diet-breaking temptation for me. Great Wall is more than just a Chinese market. The sauces and spices allow visitors to cook many major dishes of Vietnamese and Thai cuisine. The store has the area’s best supply of fresh lemongrass and plenty of cheap coconut milk. It’s less useful for Korean and Japanese cuisines–perhaps due in part to the large Korean H Mart a few blocks away–but Great Wall does have a sauce for marinating bulgogi and large jars of kimchee. The Latino section of the store is in the aisle specified for “American goods,” which might be better labeled Latin American. The aisle offers lots of beans and Goya products. I never saw an Asian buying these items. If you see non-Chinese shoppers at Great Wall, most likely they’re immigrants from Central America. In addition to the Latino offerings, in this “American” aisle there are canned goods, Pop-Tarts, and lots of space for Pringles. Without warning, the section stops and suddenly there’s organic adzuki, a bean product used to make Asian desserts. The frequency of shopping ended up as one of the most pronounced features of my experiment. I found myself returning to the store more often than usual. Great Wall has plenty of items that are durable, such as root vegetables and frozen fish, but those aren’t what I tended to buy. I was each time lured toward the fresh goods, so the idea of “stocking up” for three or four dinners never worked out, given what I wanted to eat. My trips to the store were pretty much on a one-meal/one-trip basis. That’s what happens when your meals are regularly fresh. But I didn’t always feel like getting into the car, so I skipped a few meals because of the morning hour or traffic. Those were the only ones I skipped all year. The checkout experience was distinctly non-American, and Rong Rong reports that it’s done very much as in China. I wasn’t usually smiled at, nor was I told to have a nice day. Yet overall I like the service. The items were scanned rapidly, and I never experienced a difficult time or a delay. The customers seemed keen to get on with their business–though they may have taken half an hour to choose their seafood–so I never saw anyone in front of me strike up a conversation with a cashier about the coupons, the weather, or whether the avocado sale would run another three days. Silence was the norm, and I found this to be a plus. What appears to be a dauntingly long line at the checkout is more manageable than it looks. A cashier did spontaneously speak to me once. I was buying “red bean ice cream popsicle sticks,” and she held up the box, looked at me, said “Yum, yum,” and smiled. There was no systematic display of junk food by the checkout stands, although there was an attempt to stimulate impulse purchases. Beside each stand is a pile of something; at one register it’s cheap chewing gum. On a typical day, other impulse purchases I saw were dried persimmons, buns, dates, rice noodles, and crackers, all placed in piles by the cashier. What are the results of my shopping at Great Wall for a month? • You can significantly lower your supermarket bills and at the same time eat a healthier diet. This requires spending more time shopping, but it doesn’t require additional effort beyond that. Once you get into the right supermarket, it’s self-enforcing. • If you lack vegetables and greens in your diet or don’t find them sufficiently cheap and convenient, a Chinese market can solve those problems. It really is possible to have a world–an incentive-compatible, economically functioning world–in which greens receive much more attention. Great Wall is proof that it works. • When it comes to non-fresh purchases, I realized even more how much of our behavior is due to habit and simply knowing what to do and how to find our favorite snacks. I’ve found that one of the best ways to discover new foods and recipes is to force myself out of my familiar food habitats, and Great Wall was perfect for that. The labyrinth was good for my diet and my taste buds. • Breakfast changed the most for me. Cereal was replaced by rice dishes, congees (porridges), greens, and dumplings. Shopping at Great Wall forced me to confront a food world in which breakfast is one of the most crucial cooking decisions rather than a routine to take for granted. I realized how much I had been neglecting what is, yes, the most important meal of the day. • Even if you cook and eat a lot of Chinese food, as I’ve done for years, you still are probably pretty far away from the real Chinese food experience. Shopping at a Chinese supermarket won’t get you all the way there, but it will bring you one big pleasing step closer. • On the down side, I found the cycle of always buying “fresh” a little exhausting. That’s one thing restaurants are good for: We can get fresh food without doing all the legwork ourselves. And I certainly like eating out. Now that my experiment is over, I’m going back to Great Wall regularly. I’m still eating more greens and dumplings and using easy-to-make stocks to a greater degree. Those lessons have stuck with me. Perhaps most important, I’m a lot more skeptical about the other groceries I visit. I don’t take their core features, or their defects, for granted. I’m much more likely to experiment with different supermarkets–not just Great Wall–and I think more critically about all of my food choices. 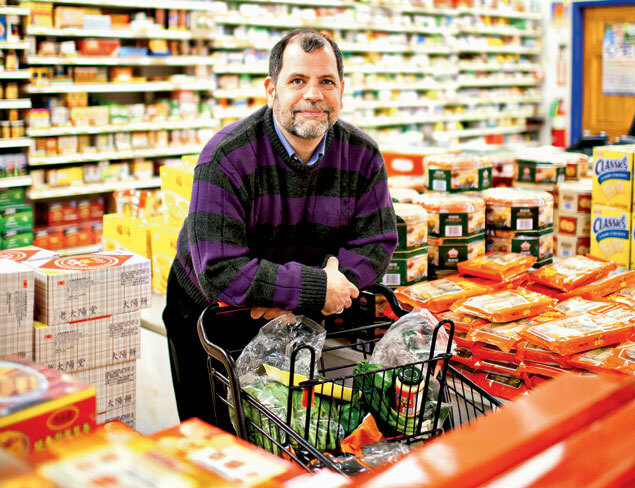 Tyler Cowen is a professor of economics at George Mason University and the author most recently of “The Great Stagnation.” He writes the economics blog Marginal Revolution and the food blog Tyler Cowen’s Ethnic Dining Guide. This article is adapted from “An Economist Gets Lunch: New Rules for Everyday Foodies,” copyright © 2012 by Tyler Cowen. Reprinted by arrangement with Dutton, a member of Penguin Group (USA).